I’ve always had a special bond with the moon and its many phases. There is something tender about gently being stirred awake by the soft glow of moonbeams on your pillow. I’m reminded of a favorite quote about the moon from that classic movie It’s a Wonderful Life when George Bailey, played by Jimmy Stewart offers to lasso the moon for his sweetheart Mary, portrayed by Donna Reed. Mary follows by asking George, then what? "Well, then you can swallow it, and it'll dissolve, see...and the moonbeams would shoot out of your fingers and your toes and the ends of your hair..."
I love that healing imagery. An experience with the moon that touched my heart happened by chance, but as we know, one thing leads to another in the realm of giving and receiving. On a cold winter Florida evening several years ago Mom called to report the weather: frost was in the forecast. It was almost dark when I hurried out to the garden, arms piled high with blankets and quilts. Theo, our feisty outdoor tabby, playfully circled round my legs as I tried to keep my balance along the garden path. In the cold night air, I quickly made the rounds, tucking in the azaleas, irises, ferns, and bushes. Afterwards, that rascal cat took my work as a blanket invitation to curl up on a soft comforter and settle down for the night. Pausing to watch his gray striped body snuggled up by a tree, I noticed the beautiful moon shining brightly through the treetops in the yard. It was so beautiful, in fact, that I ran for my camera. 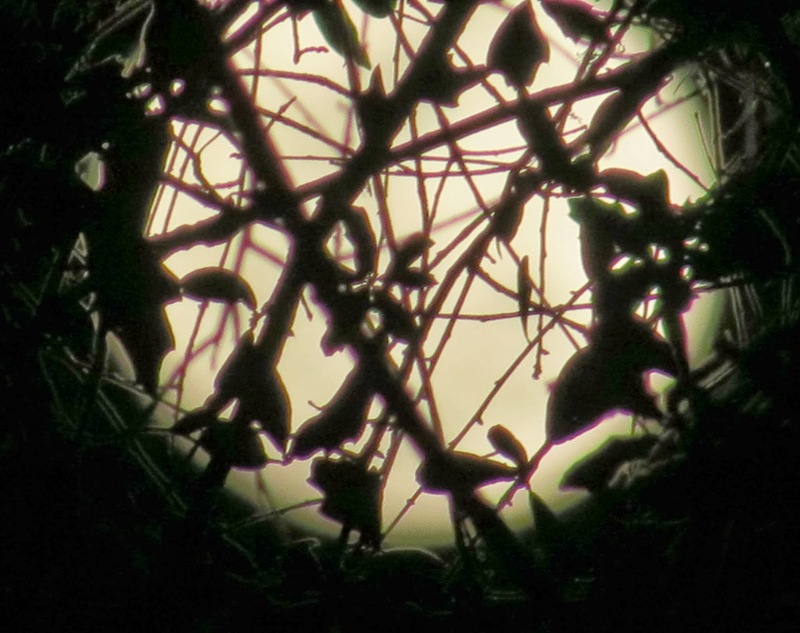 Gazing up at the bright full moon, the lens magnified until something amazing happened that gave me a new vision. 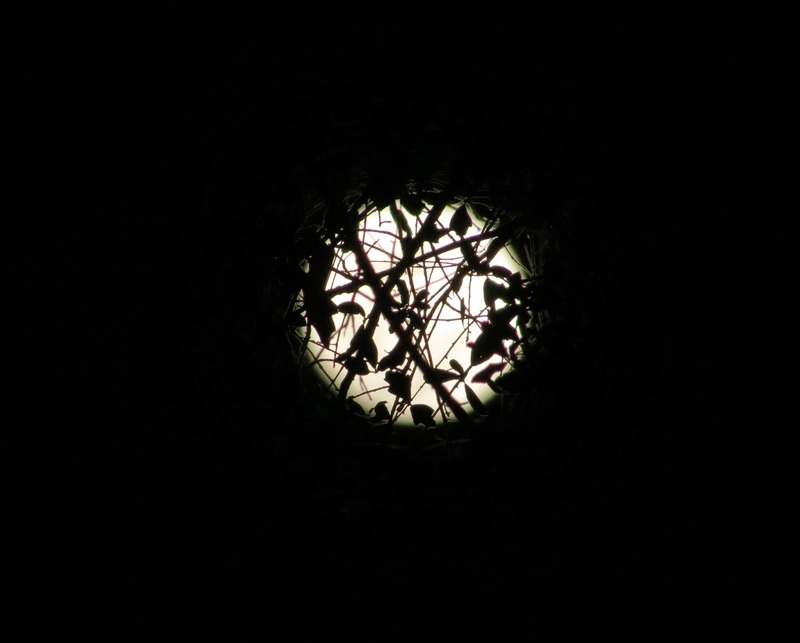 The moon grew so magnificently big and full that to my eyes it looked like a cosmic gazing ball! The imprint of leafy branches blended earth and heaven together in a moment of powerful embrace. Heavenly light and earthly trees captured a fond memory for me, and I was reminded that tomorrow was Valentine’s Day. I was so thankful for the valentine from Bella Luna. Love waits on welcome, not on time.